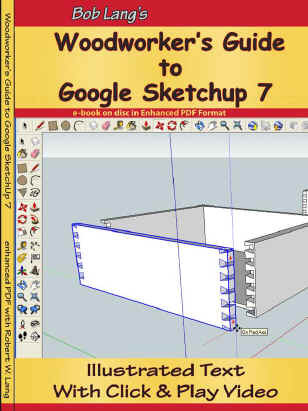 Bob Lang sent me a pre-production copy of his new 184-page digital format book Woodworker's Guide to SketchUp. Bob is producing the book himself through his website craftsmanplans.com, where you can order it for the discounted price of $29.95 with free shipping (to the U.S. and Canada) until July 1. This book offers many great things, one of which is that it's completely geared toward woodworkers. Meaning, tutorials cover cabriole legs, not cubicles and office buildings. Another thing is there are videos embedded in the text which are mini-tutorials, so you can read about a technique and then see it in action. And all with Bob's cool-1950-Lee Marvin-esque voiceover. We've all seen SketchUp illustrations, but many of us have never used the program or are new to it. Bob walks you through all the steps in order to design your own 3D models. If you're a beginner like me, start at the beginning of the book. He covers the very basics. If you have some cursory knowledge of the program, you might want to skip a chapter or two, but I would at least skim them, because Bob gives you the best configurations for the tools and preferences. Clearly, Bob knows his way around the program, and with his knowledge, you'll be able to build complex 3D models, complete with crown moulding and half blind dovetails. 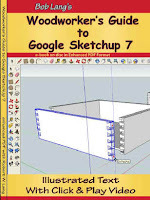 If you are interested in learning SketchUp, this is an excellent resource for woodworkers. You can download sample pages and the table of contents for your own preview.